Guide – What Is A Topographical Survey? We help you understand what a topographical survey is & why you need one for your project. In this article, we explain, in simple terms, what a topographical survey is, how it is undertaken and the key benefits in having one prior to starting a building project. At the end of this article, you will have a better understanding of the purpose of a topographical survey. If you are unsure on whether to get one prior to your building project then this article will hopefully explain why it is so useful and how it can save problems further down the line. 1 – What Is A Topographical Survey?! 3 – How Are Topographic Surveys Carried Out? 4 – What Information Is Surveyed? 5 – Why Do You Neeed A Topographical Survey? 6 – What Data Types Can Be Produced? 7 – What Information Can A Topographic Survey Produce? 8 – How Are Topographical Surveys Undertaken? 9 – How Are Topographical Surveys Produced In The Office? A topographical survey, also known as a land survey or topographical land survey, measures and identifies the exact location and specifications of natural and manmade features within an area of land. The survey is then drawn up into a precise and detailed plan. Features include human-made features such as boundaries, neighbouring buildings, walkways etc., plus smaller details (manholes, drains, fences, lamp posts, etc.). The survey also picks up natural features such as trees, ponds and ground contours. Land Surveys can encompass other types of surveys such as Measured Surveys, Monitoring Surveys, Setting Out Surveys and more. Topographical surveys are usually required by architects and engineering companies when land is being developed or altered. This includes projects such as new buildings, civil engineering projects and land repurposing. Land surveyors are, therefore, usually the first professionals on site; whether a project is a new tunnel, a bridge or a house, contractors need surveyors to record and produce detailed drawings of the land and surrounding area. 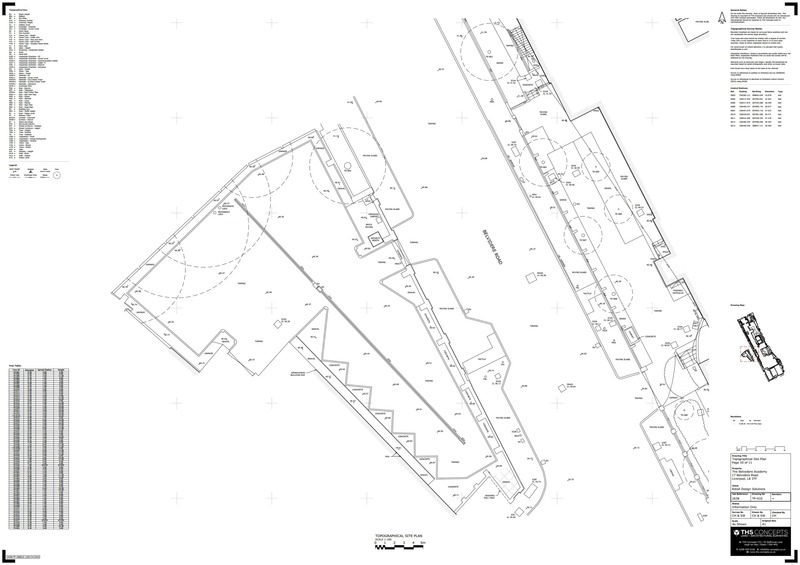 Topographical survey drawings are typically produced in a CAD software package. Once the drawings have been produced they are usually exported to PDF electronic drawings as well as A0/A1/A2/A3 paper drawings. How Are Topographical Surveys Carried Out? Topographical surveys are undertaken using a range of different survey equipment that can measure distances and angles extremely accurately (our surveyors prefer the latest Leica technology). Precise equipment helps to produce a CAD (computer-aided design) drawing that accurately positions surveyed points in both plan and height. We use sophisticated CAD software such as AutoCad and Microstation which allow us to map site measurements and create high quality, fully scaled 3D drawings of the project. Often precise GPS survey equipment is used in order to locate and position fixed points on an area of land. These points are used as reference markers, thus allowing the surveyed area to be aligned to an existing national coordinate system in both plan and height. In the UK the most common national coordinate system used in land surveying is OSGB36. Are you looking for a topographical survey quote for your project? We can help. A topographical survey is as extensive as required. Usually, a client will have a good idea of what information they require. This is usually specified when instructing a surveying company to undertake the survey work. For instance, if you are working on repositioning boundary fences, survey items such as tree locations or inspection chambers may not be required. Why Do You Need a Topographical Survey? Correctly designing drainage schemes: You will have the heights of the land and water features on site that need to be tied into. What Data Types Can Be Produced? What Information Can A Topographical Survey Produce? How are Topographical Surveys Undertaken on Site? A topographical survey is usually carried out by a team of experienced surveyors, armed with equipment including total stations, GPS equipment, laser measurement devices and tape measures. A total station is a tripod mounted device used by surveyors to accurately plot single points which can be joined into lines and arcs to form a drawing of a site. The survey begins with the team placing their fixed setting out marker points using the GPS and total stations. 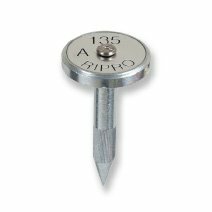 The fixed markers usually come in the form of survey nails secured into solid ground (concrete, brick, etc.) or reflective tape targets fixed to walls. These reference points are used to recalculate the position of the survey equipment as it moves around the site. They are vital for allowing the survey to be “stitched” together correctly from one set-up position to the next. Using a total station in combination with taking notes and hand measurements, the surveyor will begin to record data. The total station uses laser technology to accurately record positions points in plan and height. Using a combination of 2 points, a line can be drawn on the total station in order to begin building up a detailed picture. A good example is taking a point on either end of a wall and drawing a line between the two. In some instances, it may be necessary to use a prism mounted on a pole to pick up features. Using a modern robotic total station as the base unit, a surveyor can move around the site with the total station turning to follow as they move. Additionally, the surveyor can use a wireless computer unit to take points without looking through the lens of the total station. This often makes the process a lot more efficient. A survey nail that is hammered into the ground. How are Topographical Surveys Produced in the Office? Once the required information has been recorded on site, the surveyor returns to their office to draw up the survey using CAD. The most popular CAD software to use is AutoCAD produced by Autodesk, although there are many others in the market including Bentley Microstation & SketchUp. The recorded data is exported from the total station/GPS equipment and saved onto a computer. The surveyor uses CAD software to begin tidying up and producing a plan view drawing of the land. The process usually involves joining lines together such as the corners of buildings or adding symbols such as trees. Height markers will also be added showing the levels of important elements such as the ground, building ridge heights, watercourse levels etc. Once the base plan drawing has been produced, the surveyor begins to produce other drawings such as elevations and sections of the site. When all drawings have been completed, the surveyor will ask for a final check by a colleague before sending the CAD drawing and associated PDFs to the client. The client may give feedback to where additional detail may be required or where details can be relaxed. Drawings may be revised before the final copy is agreed. What To Check When Hiring a Land Survey Company? Experience: Land Surveying is a complicated task. Surveyors are required to operate complex survey devices and then produce clear, accurate drawings to be presented to the client. An experienced survey team has the knowledge to avoid problems and get the work completed efficiently and to a high standard. Size of company: Sometimes a “one man band” company is perfect for your requirements. On balance, however, this can cause problems with getting answers quickly, revisiting the site etc. Furthermore, a company with only 1 or 2 employees may leave clients waiting as they are regularly out of the office, unavailable to talk or not around to check or reissue drawings. Insurances: When things go wrong, there can be serious financial implications. Check your land surveying company has the correct professional indemnity insurance for their work and that the cover they provide is more than suitable for your requirements. A reputable company should also carry an employer’s liability and public liability insurance. We hope this was a valuable introduction to topographical land surveys and their uses. Have any questions? Leave a comment. We’re always happy to advise!